ST. PETERSBURG, April 9. /TASS/. 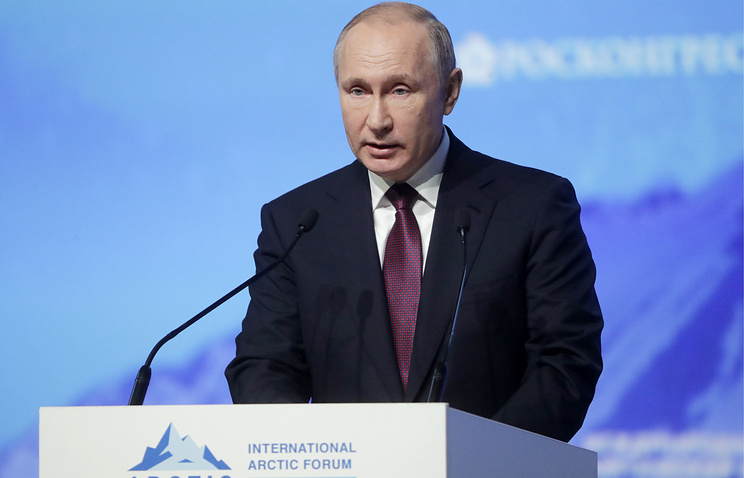 Plans are in place to shortly approve a new strategy for development of Arctic Russia by 2035, President Vladimir Putin said at the Arctic Forum on Tuesday. “We intend to prepare and approve the new strategy for development of Arctic Russia by 2035 already this year. It should consolidate activities of our National Projects and state programs, investment plans of infrastructural companies and development programs of Arctic regions and cities,” the head of state said. “Russia will take the presidency in the Arctic Council in 2021 and we offer cooperation in the Arctic Region to all countries – participants in this organization, and to other states,” the Russian President said. “I am confident that significance of the Arctic factor in the national economy will only grow further on,” Putin added. Vladimir Putin has instructed the cabinet to draft a law on a special system of preferences for investors in the Arctic region as soon as possible so that the State Duma, lower house of parliament, could adopt it in the autumn session. “Considering the peculiarities of the Arctic region, preferences for investors should be and will be even more advanced, more stable,” he said at the plenary session of the Arctic Forum. Putin instructed the government, experts and business representatives to draft a special federal law on a special system of preferences for investors in the Arctic zone. Hey Buddy!, I found this information for you: "Putin says new development strategy for Russia’s Arctic will be approved this year". Here is the website link: https://russophile.org/putin-says-new-development-strategy-for-russias-arctic-will-be-approved-this-year/. Thank you.